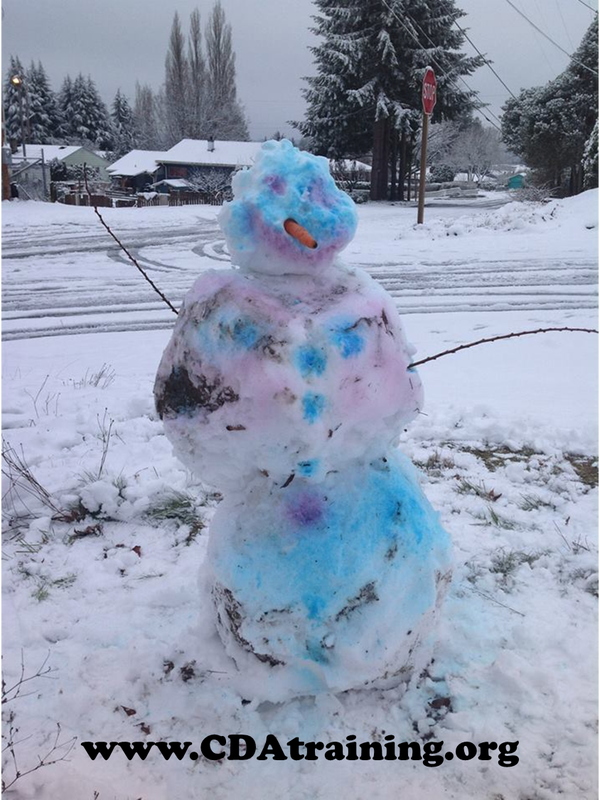 Add a few drops of food coloring to a spray bottle, turn the nozzle to "mist" and spray your snowman. Consider using grenadine, for an edible option. Popsicle sticks, white paint, black pen, felt, orange and black construction paper, buttons, and glue. Paint popsicle sticks white and allow to dry. Use orange construction paper and cut a small triangle, then use black construction paper to cut a small top-hat shape. Now use felt and cut a long rectangle shape, then cut frays at the end to create a scarf. Once popsicle stick is dry, glue on scarf, hat, nose and buttons. Now use black pen to draw on eyes and mouth. Cut out a top hat, carrot nose, scarf, and arms from the construction paper. Mix glue into paint. 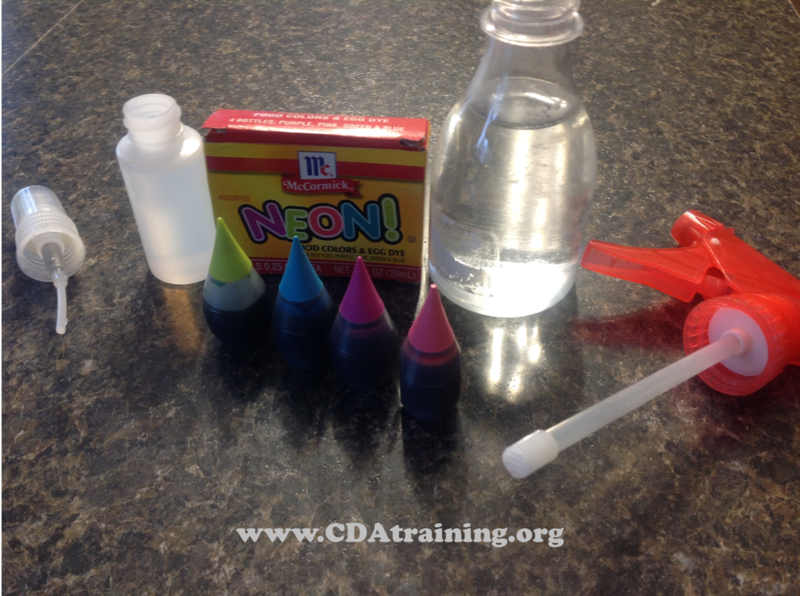 Have children paint the paint-glue mixture onto a sheet of colored construction paper. Then, have them press the snowman parts onto the paint-glue mixture. Let dry. Draw a snowman face on cups. 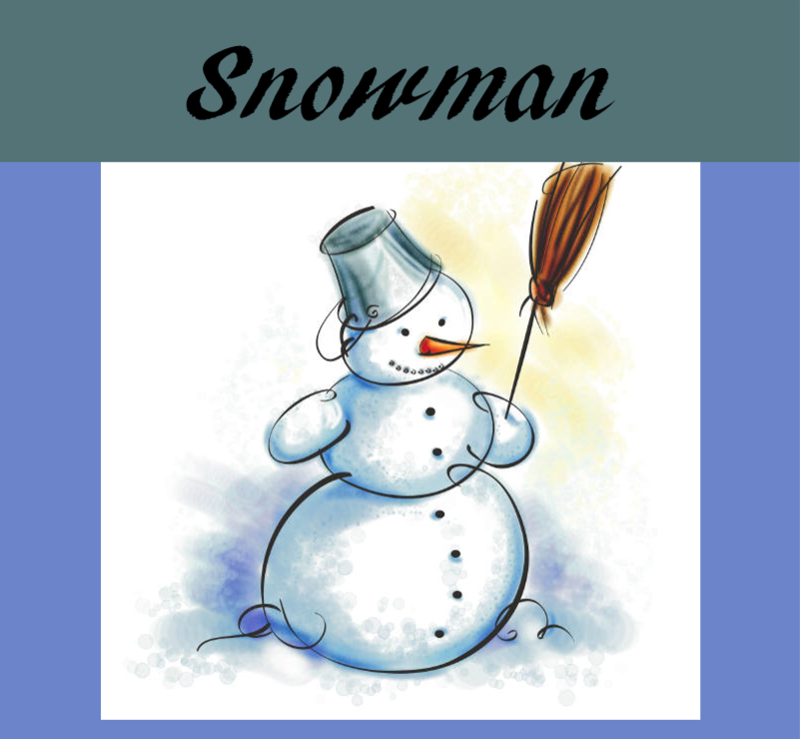 Give children marshmallows or cotton balls to use as snowballs to toss into the snowman cup. Cut ends off of egg to create a flatter surface to work with. Stack two eggs, flat, cut sides together, on top of each other and secure together with a toothpick, placed from the top straight down the center of the eggs. 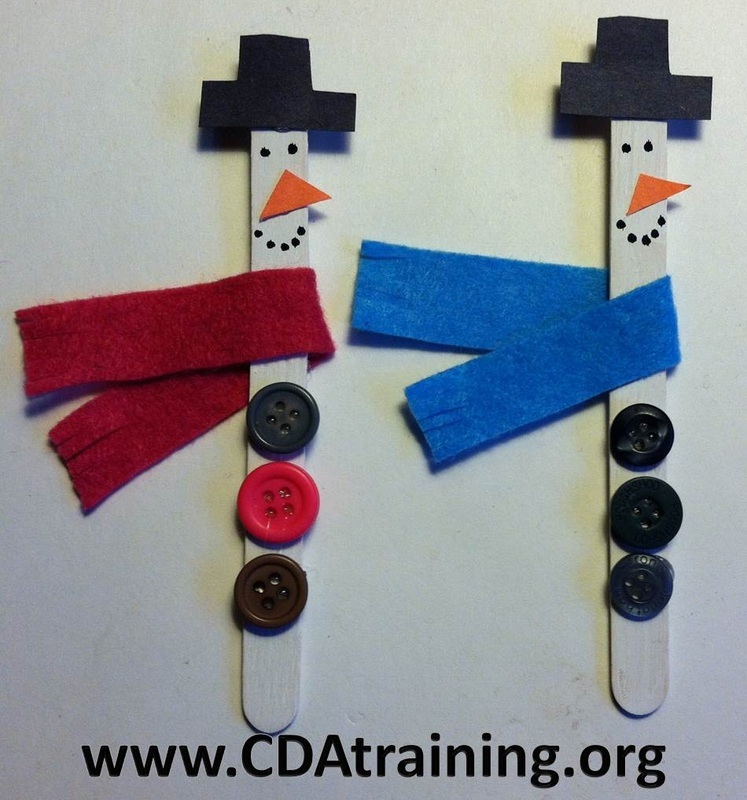 Create a top hat for the snowman with a thin larger circle and slightly smaller chunk stacked on top of each other. Secure the pieces together by using a toothpick, leaving some of the toothpick sticking out of the bottom. 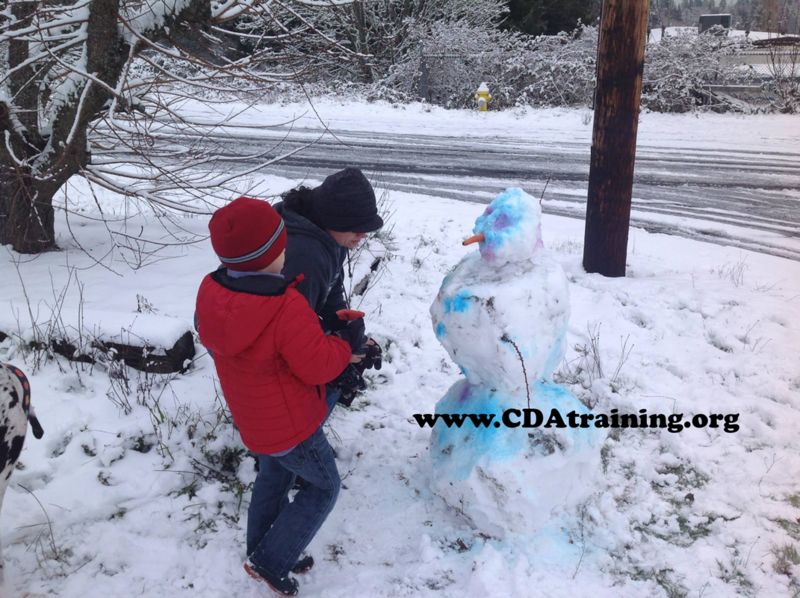 Set the hat on top of the snowman using the excess toothpick to secure it to the snowman. 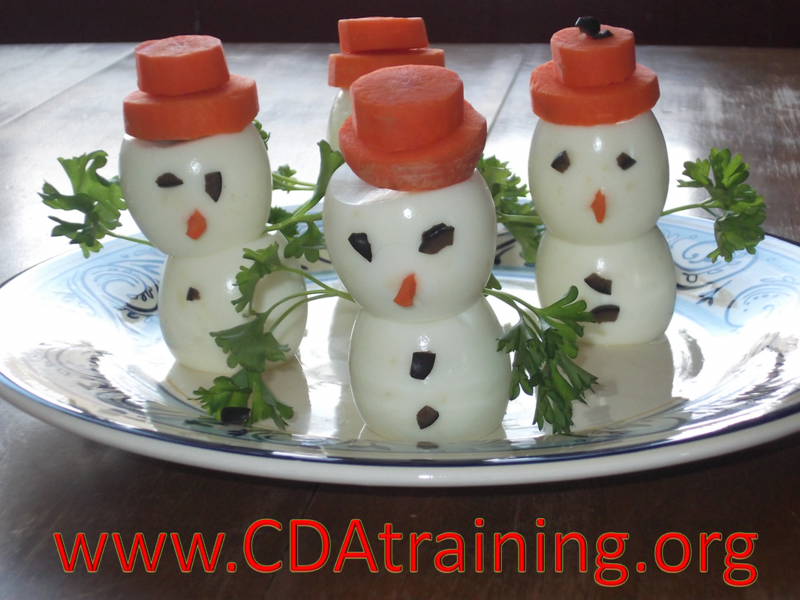 Cut a small, thin, triangular piece of carrot to use as the nose for the snowman and press in into place. Cut an olive into the shapes you desire for eyes and button and press onto snowman. 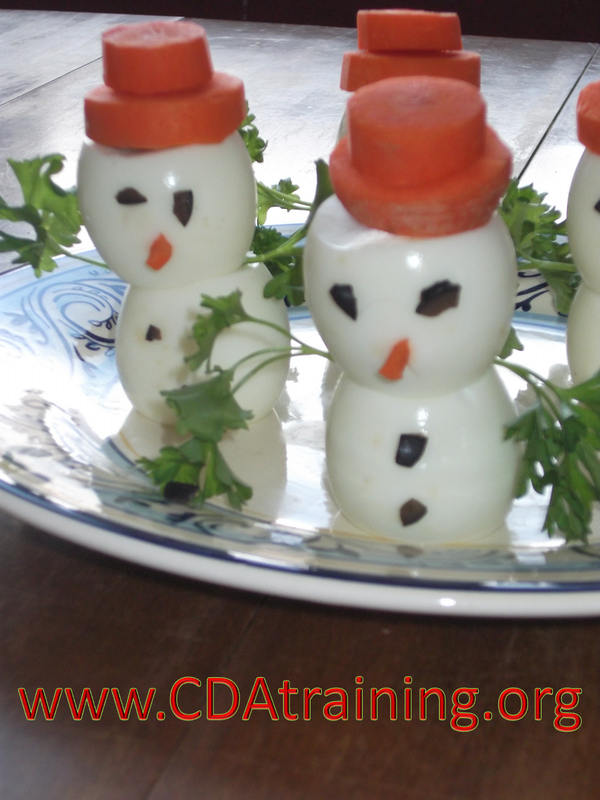 Add sprigs of parsley to the sides of the snowman for arms.